The Southern Region Waste Management Office is currently compiling a database of Tipperary craftspeople skilled in the area of repairing, reimagining and repurposing old items, from which they will engage key personnel for Reuse Month 2017. The success of last year’s inaugural event means that even more people than ever are required to facilitate workshops and teach classes as part of Reuse Month 2017 this October. Reuse Month 2017 is part of a nationwide initiative to change attitudes to old and disused objects, while encouraging people to repurpose, donate, sell or repair items and keep them out of landfill sites. Irish people currently reuse less than 2% of old bulky goods including furniture, with the majority of the remaining 98% going to landfill. Ireland has an obligation under the Waste Framework Directive to recycle 50% of household waste by 2020, and a regional target of recycling 50% managed Municipal Solid Waste by 2020 has also been set. Households across the country will therefore have to reduce their waste and increase their rate of recycling by an average of 5% in the next three years. Pauline McDonogh Waste Prevention Officer with the SRWMO said, “Repurposing, reusing and reimagining uses for old goods is a fun, cost effective and interesting way to meet those targets and reduce our waste. “2016 saw Ireland’s first national Reuse Month coordinated by the three Regional Waste Management Offices and are were delighted with the reaction we received,” said Ms McDonogh. “Here in the Southern Region our 10 local authorities ,along with Environmental Groups such as Cork Environmental Forum (CEF), VOICE, local community groups & organisations hosted workshops, fashion shows, up-cycling and recycling events, cookery demos, clothes swaps and generally got engaged in a glorious month of activities. 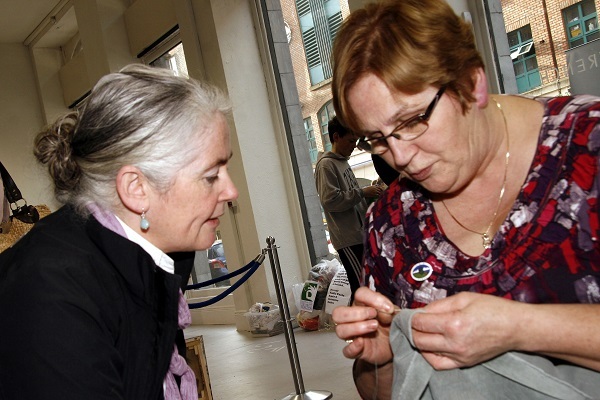 “Each local authority, including Tipperary County Council hosted a programme of events including workshops, talks, and demonstrations that promoted all aspects of Reuse Month. Their aim was to inspire citizens to actively engage in reuse at a practical level, and it seems to have worked,” she added. Seamstresses share their skills as part of Reuse Month. “Demand for this year’s event is high and we require even more facilitators and tutors to sign up before the end of August. We are currently putting together a database of interested personnel. “Tipperary is very fortunate as it has a significant number of skilled artists, craftspeople and handymen and women that can find new uses for old furniture, clothes, jewellery, bicycles and every day items, and we really want to hear from them,” said the SRWMO Waste Prevention Officer. 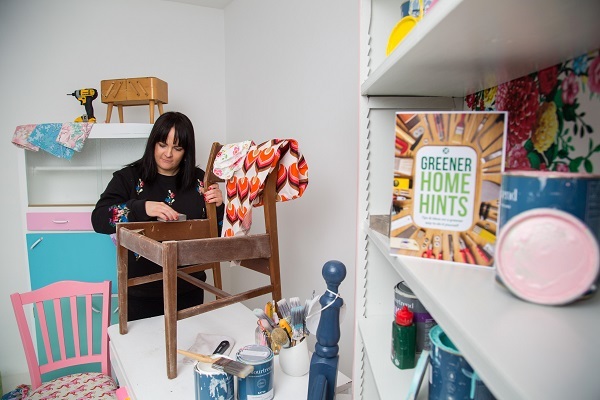 Applicants need to be passionate about their chosen interest for example art, furniture, textiles, jewellery, or mechanics. To apply to become part of the data base interested parties are asked to email info@srwmo.ie for an application form before the end of August. The form will allow entrants to indicate their area of expertise, location, costs and other details. “The theory is simple, the bigger the local directory, the more versatile the workshops we can offer in an area for Reuse Month 2017, so we really want to hear from anyone who might be interested from every area of county Tipperary,” concluded Ms McDonogh. Reuse Month October is a coordinated nationwide campaign of events to promote reuse throughout the month of October. Everyone is encouraged to take a REUSE PLEDGE for the month of October and share their reuse ideas using the hashtag #reuse17. 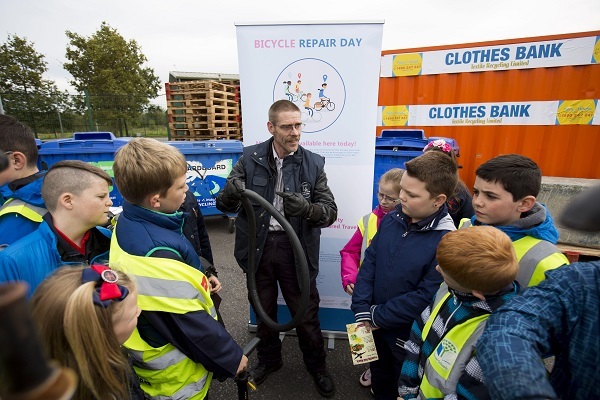 Pictured was Warren Keily, St Marys Aid demonstrating a bike repair to students from St Brigids NS at the Reuse Month event at the Mungret Civic Amenity Centre, Limerick. Photo: Oisin Mchugh True Media.